Message us about this program on Facebook! Want more elephant time? You got more elephant time! This Bonus Week is only available to students who are enrolled in and linking to a two-week Loop Abroad program. *Program begins with departure from Chiang Mai, Thailand. Groups will return to the US on final program date, plus or minus one day depending on time of departure. Tuition is $1,350 USD. Linking the Elephant Bonus Week with a program will not increase airfare. The Elephant Bonus Week does not qualify for a 10% tuition reduction when added to a program. Financial aid is not available for the Elephant Bonus Week. 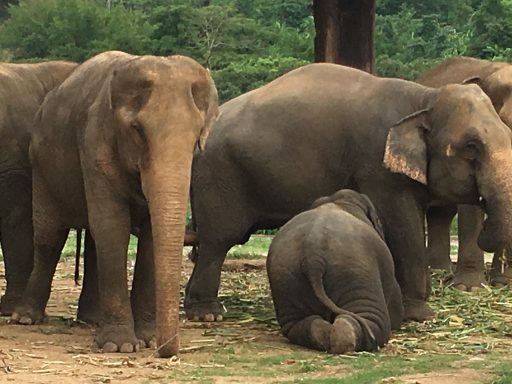 This program takes place in a rural village in Surin province where the Save Elephant Foundation is directly improving elephant’s lives by helping locals move their elephants out of difficult work such as trekking and street begging. Learn about elephant medicine from your vet instructor through lectures and demonstrations. Immerse yourself everyday in Thai culture, colors, flavors, and language for a unique cultural experience. Each day, you will work with a veterinarian to observe, examine, and care for the village’s elephants. Far from the tourist traps, you’ll also get an authentic experience of Thai culture by staying with a host family in their home. Students may share a large bed with another Loop Abroad student of the same gender. There will be at least two students with each family and at most 12 students in your group. You’ll join the rest of your group and staff each day for most meals and activities. 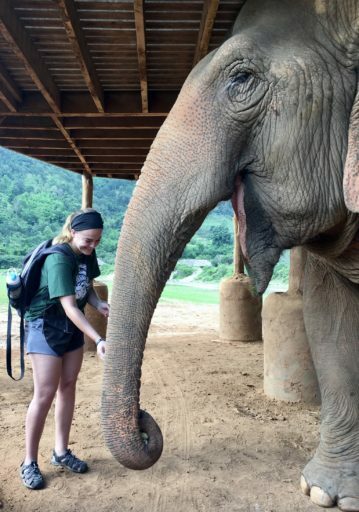 We will contribute to the community and to the elephants by spending much of our time cleaning elephant shelters, chopping sugarcane, planting trees, teaching English, and/or playing games with children at the school. Be prepared to get dirty! On hot afternoons, walk the elephants to the river so everyone can cool off! You will earn 20 veterinary hours you can count on your VMCAS application as well as 20 volunteer hours in this amazing setting. The Elephant Bonus week group will start by traveling together with staff from Chiang Mai to Surin for the better part of Monday. On Saturday after our week in the village, we will say goodbye to the elephants and return to Chiang Mai. All meals, travel within Thailand, housing, and activities are included in your tuition. Adding the Elephant Bonus Week will not increase your international airfare. If you combine a program with a bonus week in a different country, you may have to depart your program one day early depending on flight schedules.